It's been over a year since a new episode of Game of Thrones has been released, but fans are still as obsessed as ever. Between trying to figure out when the season 8 premiere date will be and debating fan theories about who will sit on the Iron Throne in the end, Westerosi experts can't stop thinking (and talking) about the HBO hit series. While we still have to wait until sometime next year for the final season to finally air, we can distract ourselves with some awesome Game of Thrones merch in the meantime. Sure, there are plenty of big-ticket items inspired by the show in stores, but there's nothing quite like filling someone's stocking with tons of fun little GOT surprises. 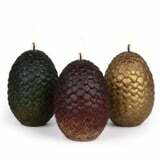 From dragon egg candles to Hodor doorstops, we've rounded up 19 stocking stuffers that every diehard fan would love to receive.